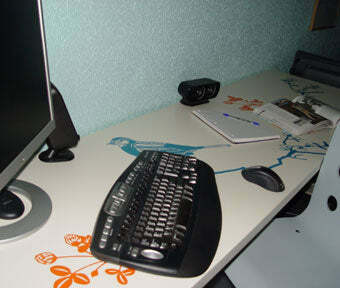 Let’s get creative with PAINTLESS design decorative surface decals. Our designs with stick to any smooth surface in your home and are very durable. Check out some more product features here. First, here are some tips to making your wall or surface look just like the professionals. Make your design look a part of the wall. Do this by not containing all of the pieces completely within your area. Instead, spread them out, don’t cramp them, and spill some of them over the edge of your parameters. Then use an exacto knife to trim the excess off. Because the decals are flexible to almost any surface or odd architecture, you can alternatively wrap the excess around a corner or under the edge of a table, etc. The flexibility also allows you to wrap them around vases, pots and pillars. Don’t be afraid to overlap your designs as well. This will add depth and fun to your room. 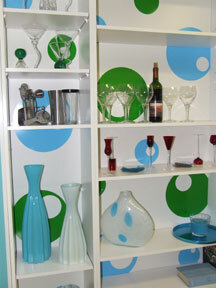 Here are a couple of pictures that shows you some other great ways to use PAINTLESS design Wall Decals. On glass, on plain white shelves for a great new look, framing the designs to really create a beautiful focal point or even on an office desk for a one of a kind look! Before applying your designs, try taping our pieces up first using masking tape or by folding back 2 inches of the backing paper and using the application tape to stick to your surface. Arrange your pieces, take a look, adjust accordingly. Below are some different ways that you can arrange your designs to help get your creative juices flowing. Create a focal point in your room by applying your designs to only one side of your wall and cascading them out from there like they are tumbling down your wall. This will create movement in your room. Create depth to your room by fading your designs from top to bottom or bottom to top. Congest your pieces and then slowly thin them out. This method also creates movement and adds interest to your wall. Create a fun boarder by loosely applying your designs in a row along the top, bottom, or middle of your walls. A fun and easier spin on wallpaper boarders. 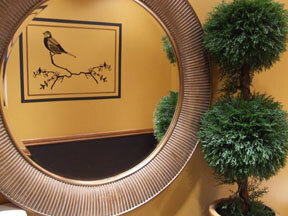 Add a focal point to your room by adding a beautiful piece of interest. Cluster or attach your designs to create one piece that you use front and center in your room. Cluster and even overlap your designs in one corner or top or bottom of your wall and explode the pieces from there. Slowly fade then out by adding more and more space in between your pieces. This will add energy to any room. Add fun and design to your walls by just scattering your designs all over your walls. Be sure to tape up your designs first so that you can be sure your pieces are evenly distributed. Wind and snake your design all around your room. Add curves and sharp turns to create unique movement and fun to your room. Just add a couple of your designs beside your bed, next to your favorite chair, or anywhere else in your home but few and strategic is key to this. Don’t use all of your pieces if necessary. Just add a few key pieces in key places to add dynamic to your space. Create a pattern with your pieces and you will design an amazing focal point that your guests will be impressed by. This particular method may take more then one package but is well worth it for the unique effect. Create fun stripes by stacking your designs on top of one another and doing so every foot or two along your wall. Gives a linear modern feel to a room. This is similar to Stripes but you are only doing this on one part of your wall. this can create height and depth to your room. Apply your designs in groups or clusters. This creates depth and interest in your wall as well. For this you will want to tape up your designs first to make sure your clusters look even. This is a great alternative to Constant because you don’t need as much material. Here are some more ideas on how to use PAINTLESS design in your home. If you have found more uses then let us know. We would love to hear from you. ideas@paintlessdesign.com. 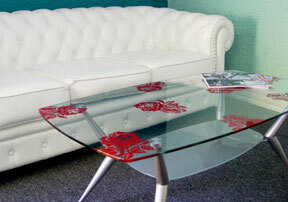 Stick them underneath a glass table and let your design shine through. Spill your designs from your wall onto your headboard or windows seamlessly. Apply the same designs that are on your walls to your coffee or side tables; maybe your lamps and a vase too!